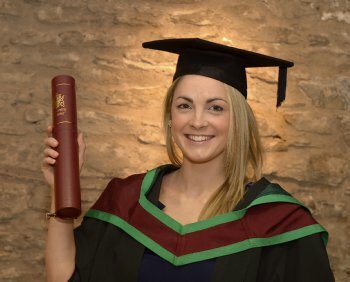 Portion control is the key to weight loss and a healthy diet – according to MSc Human Nutrition student Tara Hamilton, who graduates from the University of Ulster today. Tara, a self-confessed health and fitness fanatic from Wexford, investigated why eating perceived ‘healthy’ foods increases people’s overall food intake compared to eating ‘less healthy’ foods. “Ironically, the overall results from the study suggest that 'healthier' foods may be contributing to the obesity epidemic by giving people a false sense of security,” explains Tara. Tara’s research scooped the Kelloggs’ Award for Best MSc Nutrition Research Project and she also won the Kelloggs’ Award for Best MSc Nutrition Student. An accomplished gymnast and keen runner, rower and swimmer, Tara hopes to carve out a career combining her love of sport and health in sunnier climes ‘down under’. “I’m flying to Melbourne, Australia, in January and my aim is to work with professional athletes as I have done in the past,” says Tara. “After completing my undergraduate degree in Sport and Health I spent six months working with the Aussie Rules teams in Melbourne and it was an amazing experience.